Each month, we work to profile an ALSC member, and learn a little about their professional life as well as a bit about their not-so-serious side. Using just a few questions, we try to keep the profiles fun while highlighting the variety of members in our organization. 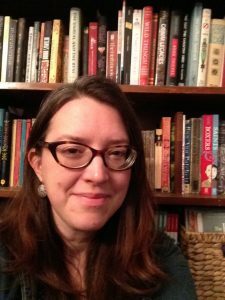 So, without further ado, welcome to our ALSC profile, ten questions with ALSC member, Sarah Stippich. I just hit ten years with the Free Library of Philadelphia. At first I was the Children’s Librarian at one of our West Philly libraries, the Blanche A. Nixon/Cobbs Creek Library, and for the past three years, I have been the Early Literacy Coordinator. In this position, I provide behind the scenes early literacy support for our 50+ neighborhood libraries and their work with young children. I work on things like the Words at Play Vocabulary Initiative and our Summer of Wonder program, supporting staff in implementing Wooden Block Parties and other early literacy programming, and coordinating author and illustrator visits to our libraries. (Eric Velasquez is coming!) I help run early literacy workshops, create booklists, write for our blog, and am basically a cheerleader for our extraordinary Children’s Librarians. I just checked and I see that I have 12 continuous years of ALSC membership! Time flies when you’re connected to the most amazing network of professional book nerds! I joined ALSC when I was in school getting my MLS and am honestly super proud of the work that my professional organization does. From taking a stand against anti-transgender legislation in North Carolina to providing excellent advocacy for our work with children and constantly pushing our profession AND organization to diversify its ranks, I know that our Board and membership is putting in lots of hard, important work. In addition to being an ALSC member, I spent some time as a YALSA member, and am currently also a member of the Public Library Association. This is combined with my activity with my local chapter of NAEYC (National Association for the Education of Young Children), in which I learn so much from early childhood educators and try to bring that knowledge into my library work as much as possible. After I was a branch librarian for about five years, I felt the need to reach out a little more and to connect with other library professionals working with kids. I started getting more involved in my library system’s committee work, then started going to ALA conferences. Pretty soon, I began volunteering for ALSC committees. I spent a few fun years as member then chair of the ALSC School-Age Programs and Services Committee and am currently on the Early Childhood Programs and Services Committee and Every Child Ready to Read Oversight Committee. Being on these committees introduced me to so many talented colleagues. I always learn from their experience, whether their libraries are similar or radically different from mine. Participating in the Bill Morris Seminar prepared me for my amazingly fun, super challenging year as a member on the 2015 Geisel Committee, and guess what you guys? I am so thrilled and honored and humbled to be the incoming chair of the 2019 Geisel Committee! I can’t wait to meet my committee and start reading ALL the excellent beginning readers. 3. How are you preparing for winter? I am so ready! I love snow and cold weather and cozying up at home in sweaters and thick socks (surrounded by some good books, of course). No preparation necessary; I’m always ready for winter. 4. What is your favorite thing about living and working in Philadelphia? There’s a lot to love about Philly. The murals. The Schuylkill River. Sun Ra Arkestra. Fairmount Park (one of the world’s largest in-city park systems). The recently erected statue of Octavius V. Catto. All the excellent Ethiopian, Indian, vegetarian, and Thai food. City Councilmember Helen Gym. International House’s film series. The walkability and bike-ability of the city. The freaky art and music scene, and the fact that there are still great basement punk shows. Bartram’s Historic Gardens. The strong sense of neighborhood pride. 5. Is there a book which you love to read over and over again? What is it? Every couple years, I need to re-read Ursula K. Le Guin’s Earthsea series. I love that she wrote a fabulous, solid fantasy trilogy, then years later went back and revisited the female characters, drawing a fuller portrait of them, despite (or because of?) their status as housewives and daughters… who can commune with dragons. 6. Do you have big plans for Thanksgiving? I’ll be taking a nice road trip with my sweetheart to visit family in Ohio this Thanksgiving. My only plans are to throw together some delicious vegan concoctions with my brother and his wife, gossip with my mom, and have a sip of whiskey with my dad. 7. Who is the last person you said “Thank You” to? I come from solid Midwestern stock, so I say “thank you” all the time. My mom raised me right. Plus, I have really amazing coworkers and colleagues, and I feel so appreciative that they share their insight, knowledge, and dance moves with me. 8. What was your favorite book when you were a child? As a kid of the 80s, I grew up with Ramona, Pippi, Little Bear and Dr. Seuss. But I also have my old copies of a few less well-known books, like Barbapapa’s School (so hippie! ), Professor Wormbog in the Search for the Zipperump-a-Zoo by Mercer Mayer, Father Fox’s Pennyrhymes by Clyde and Wendy Watson, Hailstones and Halibut Bones by Mary O’Neill and Leonard Weisgard, and Kickle Snifters and Other Fearsome Creatures by Alvin Schwartz and Glen Rounds. 9. What do you think libraries will be like 25 years from now? Honestly, I hope that we as a community of library professionals can continue to challenge our limitations by hiring and promoting more librarians of color. It’s something I think about as a White woman working in communities that are primarily African American. I’ve seen how exciting and eye-opening it can be for a young child to see people of color as librarians and teachers, and I’d love it if this were more commonplace in our libraries. Plus, we really need to shake up our expectations of what a librarian looks like, and whose stories our children’s literature should reflect. 10. What do you remember about your favorite teacher? I was lucky enough to have the same art teacher from middle school through high school, Joe Bonifas. He pushed all of his students to think critically, to find some way to express themselves, and to take responsibility for what they said and did. He taught an amazing Art History class, and to this day, he’s a well-known, prolific ironworker who makes gorgeous pieces. Plus, he let me come to the art studio during every free period and study hall to throw pots on the huge old kickwheels that he made by hand, with my only assignment being to “make a teapot.” I made the ugliest teapot! Thanks, Sarah! What a great continuation to our monthly member profile feature! I also love winter time, but we do not have much here in CA. Could you tell me a little mire about “Words at Play Vocabulary Initiative.” This was possible through a grant, but how dies it work? “Are the Play Parties like a storytime with a focus on early literacy? So, Words at Play is, as you say, a grant funded vocabulary initiative, and we have been working in collaboration with 4 other cultural institutions – the Philadelphia Art Museum, the Kimmel Center for the Performing Arts, the Philadelphia Zoo, and the Franklin Institute science museum. We focus on 2 neighborhoods with lower literacy and educational resources. Play Parties are like amped up storytimes. We do science experiments, explore music, make lots of art, and the Zoo even brings live animals! There is definitely a focus on early literacy, specifically vocabulary growth, and they are for kids birth through five. (Although we get lots of older siblings.) And really our focus is on empowering the parents in their child’s development. Anyway, it’s lots of fun! Thanks for asking. This might be a big scale event. How often do you do it? We have been able to do Play Parties every other month, 4 Saturdays in a row. We’ll see what we are able to do with the program once our funding runs out, though!